For the past few weeks its been a lot of headaches and a hefty load of confusion in what my personal style is. Since I could first buy clothes my moto was "I'm a fashion chameleon" which pretty much tricked myself into thinking that I needed nearly every style in my closet.. and that came with a big realization. I can't afford it! not as a student paying rent and other expenses anyways. Looking into my budget (and having a mini freak out with the declining balance) I needed to sort it out, and also to understand that my love of many styles was more of an appreciation of quality made garments and a thirst for understanding the history of them. I'm also dabbling a bit into learning more about mens wear. 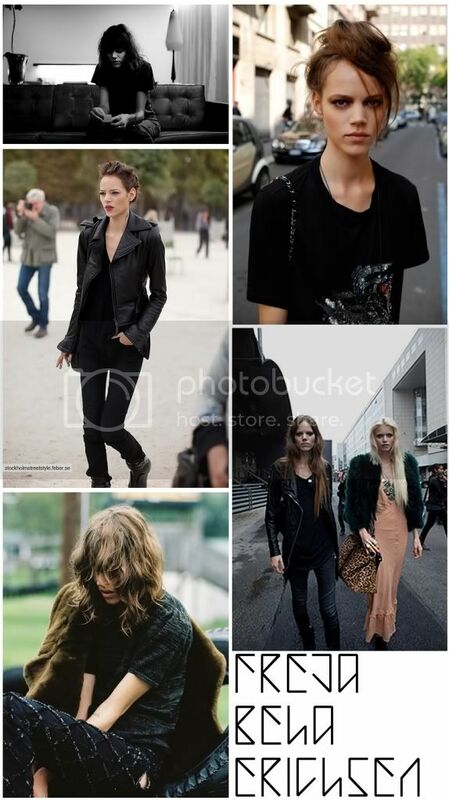 Anyways I've narrowed down a huge part of my signature style and it's rocker, leather jackets, skinny jeans and plain t-shirts are a cosistent part of my wardrobe so with confidence it can be said that I like a bit of edge and it's perfectly captured in Freja Beha Erichsen.